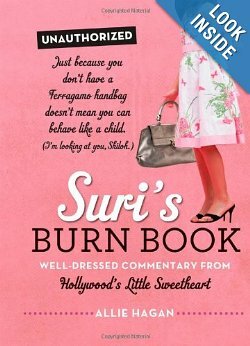 I’d like to recommend Suri’s Burn Book to anyone who hasn’t yet seen it, but I have a niggling feeling that it might not be totally OK to enjoy this website. After all, it’s an adult (Allie Hagan) pretending to be Suri Cruise, and in that character passing cutting judgements on the appearances of other celebrity children. Of course, it is a satire that highlights how ridiculous it is to analyse paparazzi photos of famous people, in the hope that we can criticise them till they seem acceptably imperfect. And it’s very funny. But I’m still not sure it’s OK. And I am not the only one to think this: The Daily Beast and The Washington Post have also posed the question. So I have drawn up a list of pros and cons, and hope that you can help me reach a morally respectable conclusion. It’s useful to have such a satire to remind us not to read the Daily Mail’s Sidebar of Shame. 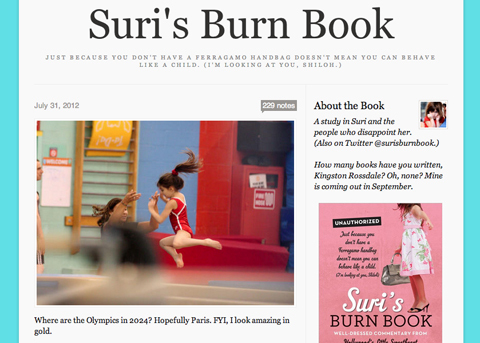 Suri is depicted as being pretty cool in an ironic sort of way. Her criticisms of fellow celebrity children are absurd rather than cruel. Katie Holmes hasn’t sued them yet, so it can’t be that bad. It sort of works as a substitute for the Daily Mail’s Sidebar of Shame. Suri is, in fact, a real person whose identity has been hijacked for comedy purposes. The kids featured on the website are also real people, and don’t really need more scrutiny. We probably shouldn’t encourage the paparazzi to take pictures of said children. Why hasn’t Katie Holmes sued them yet? There’s a published book now and everything. Oh dear, this isn’t really the result I was hoping for. But please cast your votes and help me decide! 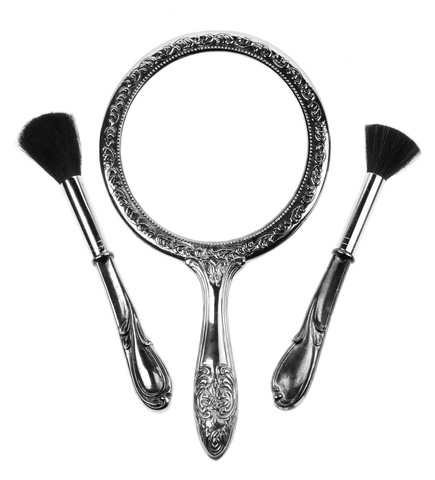 This entry was posted on Monday, September 16th, 2013 at 12:34 pm	and posted in Fashion, TV and Film. You can follow any responses to this entry through the RSS 2.0 feed.